- To prioritize is to determine the order for dealing with (a series of items or tasks) according to their relative importance. • Prioritizing can be good for daily tasks, but take some time to prioritize your personal life-goals as well. For example things you want to do, places to go and skills to learn. • When you reach the end of the list, the current favorite that remains is the single most important item on the list. Thus, this becomes your “First favorite”. You have compared it directly or indirectly with every other item and preferred it every time. Mark it by writing a “1″ beside it. • Now repeat the process (This time ignore the ‘First Favorite” because you have already ranked it) to find out your second most important item and mark it with writing a “2″ next to it. Continue repeating this process comparing two items at a time, until you have sorted the whole list or as many as you see necessary (For example, sometimes you may just want to find out the top three). - Attend a vital job-interview. - Meeting with a potential investor. - Book appointment with a dentist. - Answer a random phone-call. - Ironing and folding socks. Did you find this of value? Please show your appreciation by joining this forum. Please also share this article with others using the share-tool. Wow this is really helpful. I often struggle with prioritizing and feel overwhelmed because of it. The bubble, quadrant and grid methods are all interesting. especially the quadrant. I have often thought I run around doing what is urgent instead of what's important. Any of them should help me if I'm undecided and procrastinating. On a day when I have too much to do it helps me to tackle the toughest one first when I'm fresh. The tasks go easier and quicker as I tire physically and mentally. It also avoids having that thing I don't like to do hanging over my head. Great info I especially found the "Bubble Prioritization" helpful. Reminds me of a classic bubble sort in computing. It hit a chord with me because of this and the application it has to 'real life' to-do lists. I dont think I have EVER seen Prioritizing broken down to this extent and yet still make sense. This is an awesome post! Good Stuff, and Thanks! I use the four quadrants method a lot and find that this really helps me do the things that are important for my long term success and fulfilment. There is even a Mac and iPhone app called "Quandranto" which I use. It's also important to give the task you are currently doing your full attention. I quit my email programs and close any other distracting websites that I don't need. It'a also useful to set an outcome before you start a task as this focus's your mind. Tim Ferriss has many great tips for prioritising and time management in his "4 hour work week" book. It's well worth a read and it's quite entertaining in places too! If something is a high priority, you need to give it your full attention, and I've found you can't fully focus on something, unless you have all those other nagging tasks off your mind. This is why have a good organization system to manage all your tasks is so important. We've all had that high priority task we know we needed to get done, but the idea of "I really should reply to that email" or something similar nagging away at us. 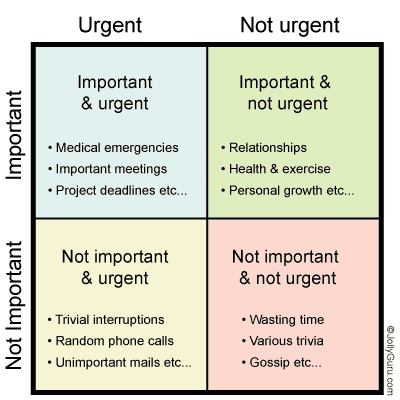 Once you have all those other tasks parked somewhere and off your mind, the 4 quadrant model is good to help set priorities.